Hi, im counting 48 cuts..? The pinout of the TL061 is wrong. Pin 8 is NOT the + power! There are several other errors, too. This is NOT verified! The layout does not say Verified. V+ should have gone to TL061's pin 7 and there was an extra 1nF cap between pins 1 and 2 of the bottom TL062 (wouldn't have been a big deal). 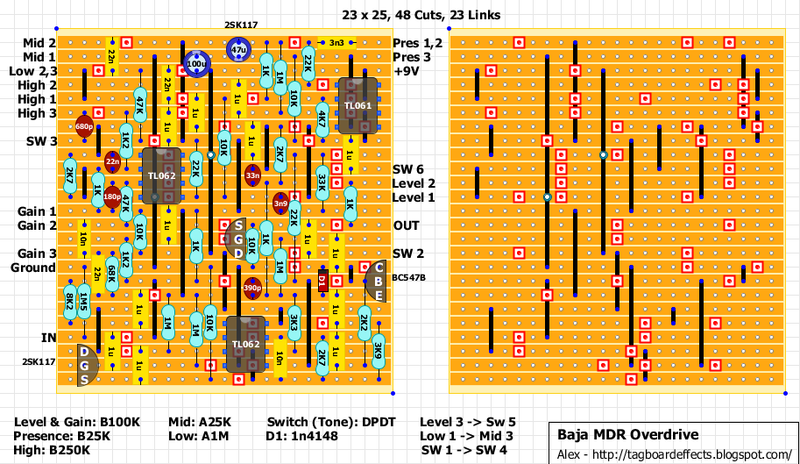 Those two issues have been fixed and from what I can see it matches the schematic. What are those several errors? 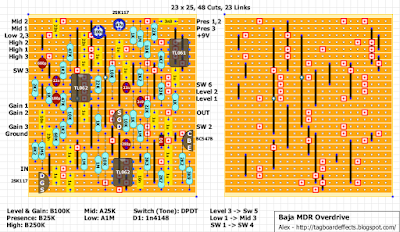 Hi Alex - the layout is missing the 1M resistor which biases the gate of JFET buffer. I think if this is fixed, the layout will be OK.
Hi Frank! The 1M going to vbias? It's there, next to the TL062's pin 4. Hmm...you're right! Sorry - I missed that! Someone at FSB reported some strange behavior with the JFET, and maybe he was using an older version of the layout. Anyhow, hopefully will verify your current layout as it looks OK. I finally got my 2SK117 transistors and got this going last night. I can verify that it works. It also sounds amazing.